One Parramatta Square (1PSQ), in Sydney’s west. University of Western Sydney (UWS), offering first-class educational facilities for 10,000 students. NSW Premier and Minister for Western Sydney, Mike Baird said 1PSQ would be a welcome development for the CBD. “Parramatta is the geographic heart of Sydney and with the revitalisation of its CBD, residents of the surrounding area will now have the opportunity to work and study close to where they live,” Mr Baird said. 1PSQ is set to achieve a 5-star Green Star rating, targeting environmental design excellence in sustainability. Leighton Properties National Head of Commercial, Andrew Borger, says the development showcases the company’s capabilities of planning, structuring and delivery. “The breaking of ground...signals another exciting stage in the development and is an example of our vision of developing thriving, sustainable buildings in strategic CBD areas,” Mr Borger said. 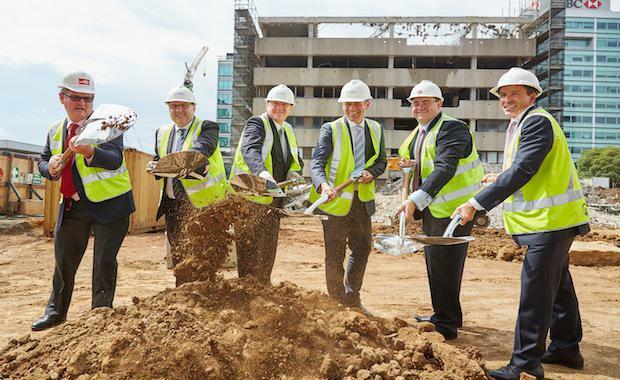 The development will comprise approximately 26,500 square metres spanning 14 levels, and is set to be complete in late 2016 as part of a broader $2 billion Parramatta Square urban renewal project.